Epic Games have revealed another vehicle that is coming to Fortnite Battle Royale. Epic Games have officially announced the Creative mode for their most popular game, "Fortnite." This mode is something new and it allows players to completely customize the in-game world, as well as change many other settings. This is the first step towards custom maps and custom lobbies with other players, and the game developer has big plans for its future. Many YouTubers have uploaded videos of the upcoming mode, showing us what we can expect with the Thursday's update. 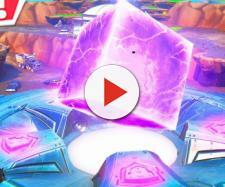 Epic Games have also revealed a few features in the official Creative mode video, but they may have shown us a little bit more than they wanted to. While the "Fortnite Battle Royale" creators haven't leaked anything big prior to season 7, they have accidentally shown us that a new vehicle will be added to the popular video game. The video game creator has released the official trailer for the Creative mode around 10 AM eastern time. The short video had around 20 seconds of a gameplay footage, and it has revealed a flying vehicle that will be added with the upcoming patch. Take a look at the trailer below and pay attention to the 0:16 mark! As you can see in the video, the player whose point of view we can see is holding five different "traps" that look like an airplane. It is important to note that every transporting vehicle and every single trap are classified as traps in the Creative mode. At the moment, we are unsure whether this vehicle will be used for transporting players or simply for attacking enemies, but we will find it out very soon! Epic Games have also shown an airplane in the third teaser for the upcoming season. Additionally, "Fortnite Battle Royale" data miners have revealed the presence of this vehicle a few weeks ago. The game developer may not add airplanes to the battle royale mode at first, but they will be available in the new mode, and players will be able to use them against each other. It is important to note that not all "Fortnite Battle Royale" players will have access to the new mode. Season 7 will bring a new Battle Pass, and players will have to buy it in order to play the Creative mode and play their custom maps with up to 16 players. Those who cannot afford or don't want to buy the new Battle Pass will be given the access shortly after. The early access phase ends on December 13, and that is when the new mode will be available to all "Fortnite" players.